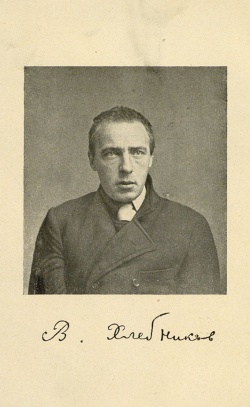 Velimir Khlebnikov [Велимир Хлебников; born Viktor Vladimirovich Khlebnikov, Виктор Владимирович Хлебников; 1885-1922), was a Russian Futurist poet and playwright, also interested in mathematics, history, and mythology. Based on chronology in Khlebnikov, The King of Time, ed. Charlotte Douglas, 1985, pp 239-247. 9 Nov 1885: K. born in village of Malye Derbety, ca. 80 km south of Volgograd. 1903: Graduates from Kazan gymnasium; enters university. 1908: Sends early poems to Ivanov. Moves to Petersburg; enters university. 1909: Meets Kamensky. Publishes first literary piece. 1910: Plans trip to Montenegro. Meets Burliuk and Matyushin. Breaks with Ivanov and Symbolists. 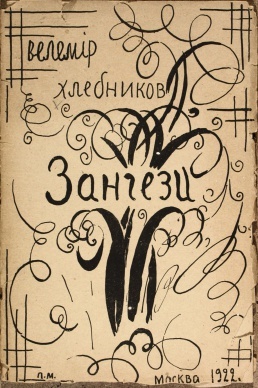 "Incantation by Laughter" published in Kulbin's Impressionists' Studio [Студия импрессионистов]. The collection A Jam for Judges [Садок Судей] published; includes "O Garden of Animals!". 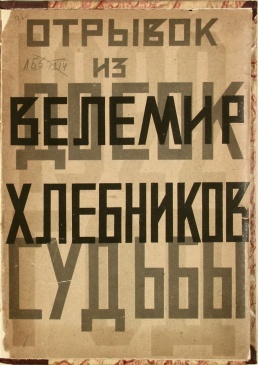 1911: Meets Mayakovsky. Working on theory of history. 1912: Visits Burliuk estate in southern Russia. A Game in Hell [Игра в аду] by K. and Kruchenykh. Contributes to A Slap in the Face of Public Taste [Пощёчина общественному вкусу]. The World in Reverse [Мирсконца] by K. and Kruchenykh. 1913: Contributes to A Jam for Judges II [Садок Судей II]. Mrs. Laneen. "Usa-Gali". "Nikolai". "The Word as Such" [Слово как таковое]. "The Letter as Such". 1914: Breaks with Burliuk over Marinetti. 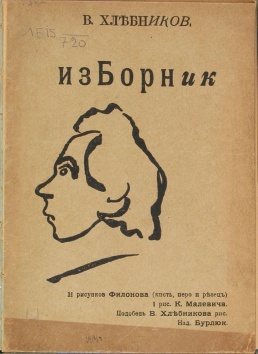 Selections of Poems [Изборник стихов]. Creations [Творения]. 1915: Writes "K" (pub. 1916). 1916: Society of 317 (Presidents of Planet Earth) founded. Drafted into army. Stationed near Saratov. 1917: Receives military furlough. In Kharkiv, writes "An Appeal by the Presidents of Planet Earth". In Moscow and Petrograd; with Tatlin plans program of 3 plays. 1918: Works for newspapers in Nizhny Novgorod. Works for newspaper in Astrakhan; writes "October on the Neva". 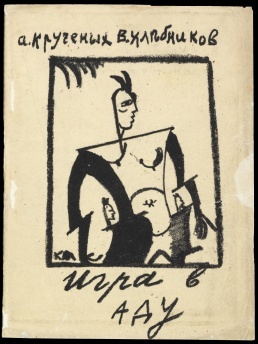 1919: Spends early spring in Moscow; contributes "The Head of the Universe" and "To the Artists of the World" to proposed collection, International of the Arts. In military hospital with typhus. 1920: In Kharkiv, after release from hospital. Arrives in Baku; works for newspaper and cultural-educational section of Volga-Caspian fleet. In Baku invents Laws of Time. 1921: Sails from Baku to Enzeli, Persia. Returns to Russia; goes to Piatigorsk. Returns to Moscow. 1922: Finishes Zangezi. Excerpts from the Tables of Destiny [Отрывок из "Досок судьбы"] published. Zangezi [Зангези] printed. 28 June: K. dies in village of Santalovo. Kruchenykh, Khlebnikov, Igra v adu, 1912, IA. 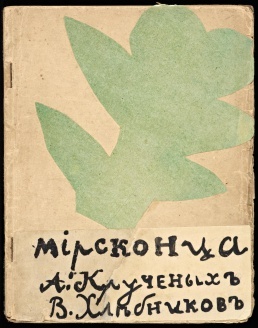 Kruchenykh, Khlebnikov, Mirskontsa, 1912, IA. 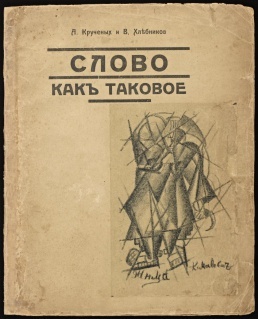 Kruchenykh, Khlebnikov, Slovo kak takovoe, 1913, PDF, IA. 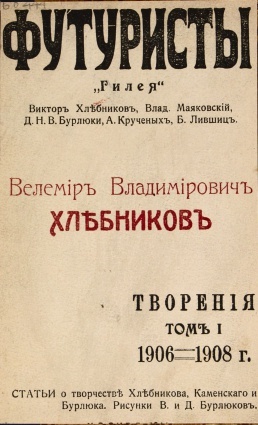 Tvoreniya 1, 1914, PDF, JPG. Otryvok iz "Dosok sud'by", , JPG. with Aleksei Kruchenykh, Igra v adu [Игра в аду], Moscow, 1912. This page was last modified on 21 August 2018, at 10:56.